We're celebrating Amanda Murphy's new Winter Games fabric collection with a blog hop, featuring mug rugs. They're perfect for a cozy cup of hot chocolate. Enjoy all three mug hop posts and make sure you enter to win a fat quarter bundle of Winter Games fabrics to play with! 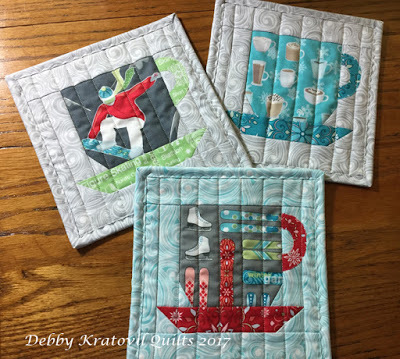 Debby from Debby Kratovil Quilts is the last stop on our hop, and we love what she's done! If you're new to paper piecing, a small project like this is a great introduction! Head over to her blog to check out her fun fabric choices and be inspired! You'll also be able to enter to win a bundle of Winter Games fat quarters. Today you get to see some awesome fabrics by Amanda Murphy for Benartex. I've sewn with Amanda's fabrics several times and I think her choice of colors and motifs is one of my favorites! With a mug rug theme, I thought a paper-pieced Coffee Cups design would be perfect! Come see how I fussy cut the fabric to make literal mug rugs! Super cute mug rugs. Adorable new line of fabric too! Such fun fabrics! Just LOVING the swirly coordinates! I can see those working in every season! Thanks for the inspirations! Love the colors, so many possibilities. So great to see the different mug rugs. Thank you. Love all of Amanda’s fabrics!